* The transaction fee is £0.00 for E-ticket (Group email), £2.00 for Box Office Collection or £2.81 for Standard Delivery. The Golden Age of TV are an indie art-rock quintet from Leeds and have only released a couple of singles so far but to much acclaim. They have played Leeds and Reading festival, and all their recent home-town shows have been sold out. We Bodys have missed out on tickets so many times that we thought the only way we'd get to see them was to book them! Their whip-smart drums lock in with gloriously fuzzed out glam bass and disconcertingly swirling guitars bounce around your ears. 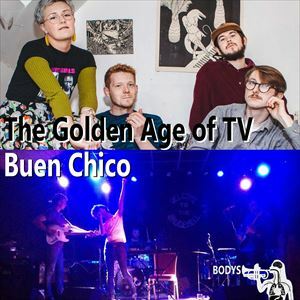 Buen Chico are the longest running and probably greatest indie guitar pop band from Leeds band ever. The band started in the early 2000s among the explosion of guitar bands, but as they continue to create beautifully crafted songs with exceptional lyrics they grow with every listen and every year. Sounds like the greatest version of every band you could ever think of, specifically The Strokes with a little of Jason Molina to break your heart.